Make sure to use enamel acrylic paint, and not just regular acrylic paint in order for the paint to stick to the jar. After this kind of paint is cured, it is dishwasher safe, though the painted surface should not be eaten off of. Put down a solid layer of brown enamel acrylic paint on the exterior of the glass jar. Let dry. Using a very thin brush and black pain, paint on lines to look like it is the grain of the wood. This could also be done with a sharpie if you aren't good with paints. Be sure to use a light touch when applying the black markings. Take the beige color and paint a large curved line, so it looks like a label has been applied on the jar. 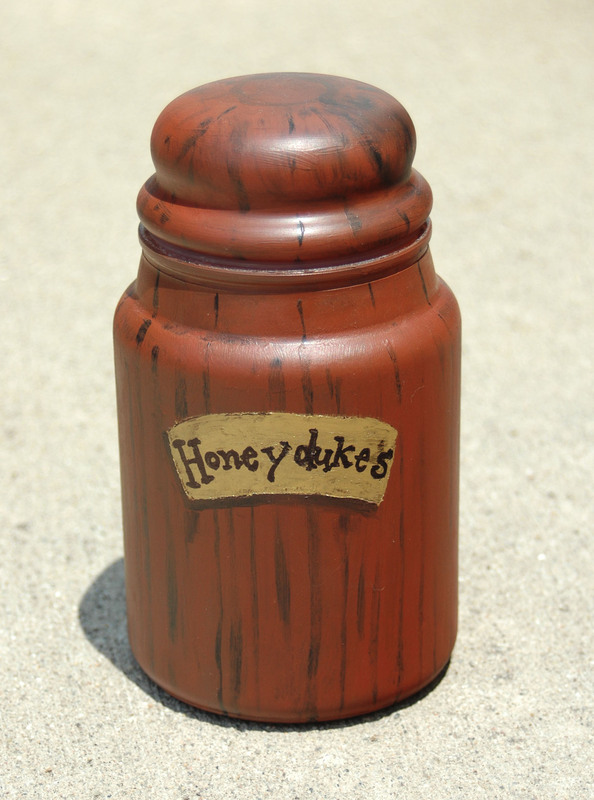 Once the paint has dried, write or paint “Honeydukes” in black. Once the paint is dry, bake the jar according to the paint instructions. © Caroline C's tutorial was taken with permission.